INTERVIEW WITH ALEKSANARA MACIUSZEK - THE AUTHOR OF THE FILM "CASA BLANCA"
"Casa Blanca" by Aleksandra Maciuszek is one of the five Polish documentary films which will be shown within the frames of the Swiss festival Visions du Reel. The film will compete for the award in the International Medium-Length Film Competition. We would like to invite you to read the interview with the film's author. Daniel Stopa: The story, which you show in "Casa Blaca" takes place in Cuba, thousands of kilometres away from Warsaw. How come that it was there where you got to know the protagonists of your film? Aleksandra Maciuszek: I got to know the protagonists of the film during the time when I was searching for the subject matter of a film study for the end of my film studies in Cuba. I was wandering through Havana, quite blindly. I was in Casa Blanca several times, I liked the atmosphere of a fishing village. One day I saw there Nelsa and Vladimir, slowly strolling through the street and holding their hands. It was not clear who leads whom, who helps whom. They looked as if they were out of this world. It was a very powerful, very "cinematic" image. I asked my friends from the village to introduce me to the mother and son. We grew fond of each other and I began to visit Casa Blaca regularly. The film was meant to be short, and its key element was to be the daily wanderings of Nelsa, desperately looking for Vladi. Ultimately, however, you abandoned this subject matter while making your diploma film and you returned to it later on. Why? The story proved to be too difficult for me. The subject matter seemed too tragic for me, the situation of mother and son - too hopeless. I was afraid of making a film about hopelessness. It was also hard for me to understand the protagonists, their language, motivations behind their actions. At the last moment I changed the subject of my diploma. I returned to the research after graduation, calmly, without any pressure of time. I spent a couple of days in the village with the cameraman and the soundsman and we shot material for the teaser. We discovered a lot of new things, which we liked very much, such as the sense of humour, common to the mother and son. We made friends with the local drunkards, Vladi's friends. We familiarised ourselves with the subject. In the film, you clearly emphasise the passage of time, introducing the division into months. Does this time in fact correspond to the time you spent with the protagonists? More or less, we shot for a couple of days in December and January, later intensively from the half of February to the half of May, living in the village for several weeks. Why it was so important for you to emphasise the passage of time? I don't know whether it was so important. The idea to base the time of action on passing months, as well as the idea of introducing subtitles, appeared at a quite late stage of editing. It was a formal decision, an aesthetic one, it helped us in thinking about the film itself. We felt that this decision frees us from the pressure of traditional three-act structure, allows us to put the stresses in a more horizontal way. The passing months gave the film the character of a chronicle, in which objectively more and less important events could freely intertwine. We also liked the slowing down of the action, which resulted from introducing the subtitles as well as placing the story in the context of changing seasons and unchanging landscape of the bay... Of course, from the point of view of the narrative development, introducing this monthly order makes the viewer informed, how quickly Nelsa's condition deteriorated, how quickly the protagonists' life changed. However, from our point of view it was of secondary importance. You mention formal and aesthetic decisions. Did you have any predefined arrangements concerning the cinematography and filming the protagonists? At the very beginning of the filming, it became clear that any kind of orthodox approach to the form, e.g. decision to use only hand-held shooting or a tripod, or working on a precisely specified size of a set would not work out. We constantly had to adapt ourselves to the reality. One time, we took part in an extremely dynamic and dramatic situations, and other times we had to wait for hours for a simple gesture, which would be a synthesis of the feelings we wanted to describe, or we had to spend hours constructing them. The only rule we accepted was that our glance would always concentrate on Nelsa and Vladi. No matter what interesting things happened nearby, it is them who always had to be in the frame. Thanks to this, we knew that during the editing stage we would, to a large extent, build upon the sound coming from outside the frame. This also influenced some filming "strategies." The fact that once we are close to the protagonists and other times we look at them from a distance, also resulted from our willingness to reconcile the divergent motivations behind our actions. On the one hand, we wanted the viewer to get well acquainted with the protagonists, so that he could feel and understand their emotions. We did not want the film to resemble such a cold, pseudo-objective observation of "the odd" or "the abnormal," so hence the closeness, following the protagonists. On the other hand, we were fascinated by the counterpoint, created by the landscape of the bay and the village. Nelsa and Vladi are a part of the local community, they function in a specific landscape, also in the social one... This is another thing we wanted to emphasise. Anyway, sometimes a seemingly more distancing composition is much more emotionally charged, and at the same it happens to be less manipulative. But, generally, as far as filming strategy is concerned, the most important things were our reflex, intuition in foreseeing and adapting to the reality. In very spontaneous situations, decision where we set the camera was connected with risk: either it would be successful or not. 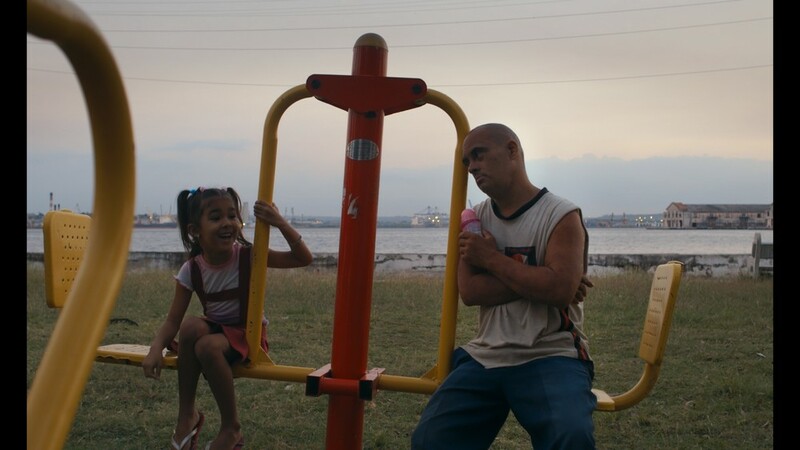 From the beginning it was clear that we do not make a film about disability, about the disabled, but about family, about relationship of two people. Of course, the protagonists' contacts with the so-called rest of the world are not without significance, as the narrative develops, they become more and more meaningful and confrontational. It is not, however, a film about people from the institution, of course, though usually, as you say, people like Nelsa and Vladi, the sick, the old, the ugly, are relegated to such spheres of "invisibility." The most important feature and strength of Nelsa and Vladimir is that they do not consider themselves worse, or even particularly different from the rest. They both believe that they have the full right to live the way they like, to make decisions about themselves, to defend their own subjectivity. Asking questions about the validity of this feeling of theirs was crucial to us during the filming. You emphasise that it was a very difficult subject, that you had to mature to tackle it and in a way, to gnaw at it. During editing, did you feel that some of the scenes deprive the protagonists of their privacy, that you cross a kind of boundary? We had material at our disposal, and we knew at once that we can only reject it. For instance, we did not want to show scenes in which the horrible living conditions of the protagonists are in the foreground. We also did not want to show Nelsa at the critical stage of her illness, because this material and emotions which it evoked were unnecessary for us. We did not want either sympathy or pity for the protagonists. It was quite simple. On the other hand, there was also material with which it was much harder to part: sequences which initially seemed to us good, extremely powerful, dramatic. Later on it turned out that there is no place for them, because they began to overshadow other, more important elements of the story. It was the case with the material showing Vladi's drinking problem. Finally, it was included in the film, but in a very abridged form. Another problem concerned the material which presented the local community and the protagonists' family negatively. During the editing stage, all of them easily transformed into heartless, cruel antagonists of our protagonists. The entire material was full of traps. It turned out that making a film which is meant to, at least partially, present the "psychology" of someone considered mentally handicapped, during the editing stage you need much more careful constructing of the protagonist than in the case of someone "normal." In the case of Vladimir, the edited material extremely easily changed its meaning at the reception stage. Funny scenes easily started to be seen as tragic and vice versa: scenes, which initially were tragic for us, turned into funny ones in the eyes of the viewers. This arbitrariness was very dangerous for the film. During the editing stage, outside opinions were very helpful for us, particularly the ones of Paweł Łoziński, my art supervisor, and of Tomek Wolski. At the end I would like to ask, are you still in touch with your protagonists? What happened to them later? Yes, I have recently been to Cuba, and I have visited Nelsa and Vladi. They do not live in Casa Blanca anymore. I would rather not give any information about what is happening to them now. Their situation is still uncertain, and it is irrelevant to the film, anyway.